Because the the 2016 Beetle R-Line is still based on the older A5 architecture, it was not updated with the latest generation of the 2.0 liter EA888 engine. This means that it’s one generation back of what most VW and Audi models now have. This version of the 2.0 liter four-cylinder engine is still direct-injected and turbocharged but rated at 200 horsepower and 207 pound-feet of torque. For that it requires premium unleaded fuel, but will run on regular but at a lower output level. It’s mated to a six-speed DSG transmission in this car, but also available with a six-speed manual in the Beetle R-Line. For power and fuel economy the engine features variable valve timing on the intake side and direct fuel injection. 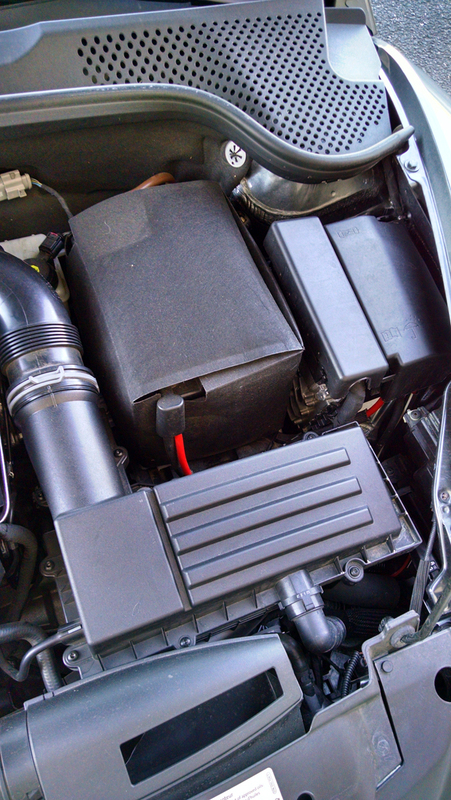 You can’t see much of the fuel system here with exception of the cam drive high-pressure fuel pump. 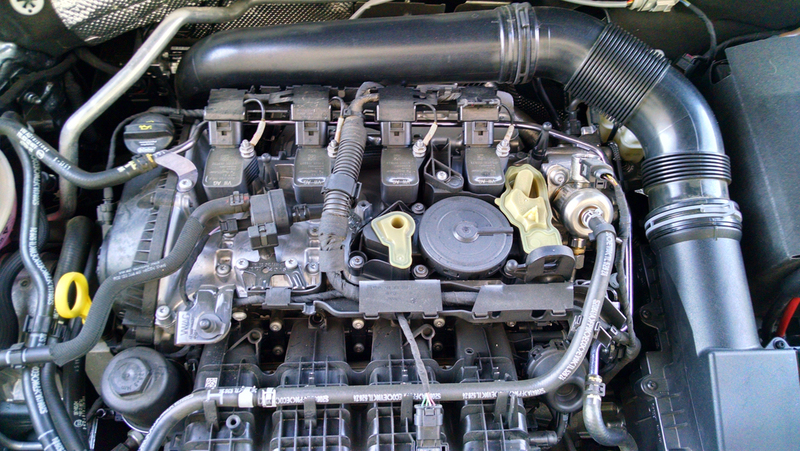 The rest of its apparatus including a high-pressure fuel rail and fuel-injectors is hidden down below the intake manifold. There the injectors reach directly into the combustion chamber which has a relatively mild 9.6:1 compression ratio, common on turbocharged engines. The engine itself features an iron block with two rotating balance shafts driven by the crankshaft. These shafts offset vibrations from the rotating assembly of the crankshaft, rods and pistons which results in a much smoother and refined feel. Its cylinder head is of course aluminum. 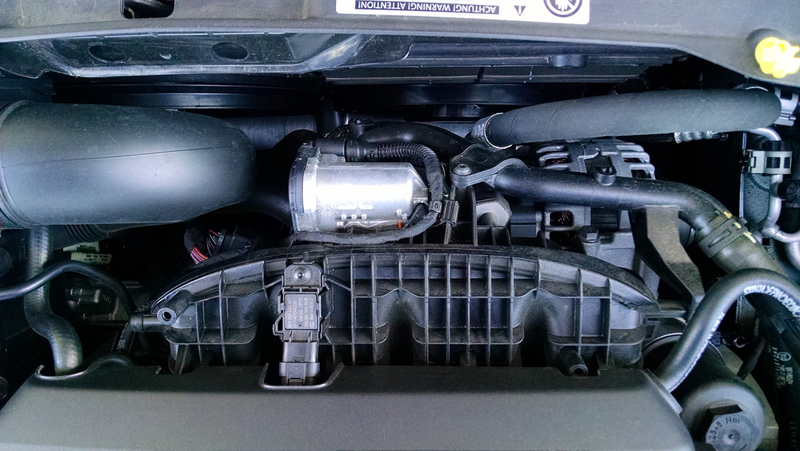 Following the air-flow, the intake charge comes into the filter box just behind the grille, and then heads up through a tube toward the firewall then around the back of the engine to its turbocharger. You can’t see it well from above, but the water-cooled turbocharger is located down low at the back of the engine. One key difference here between this engine and the latest generation of the EA888 is its cast-iron exhaust manifold and turbocharger housing. On the newer design, the exhaust manifold is integrated into the head for better thermal efficiency. 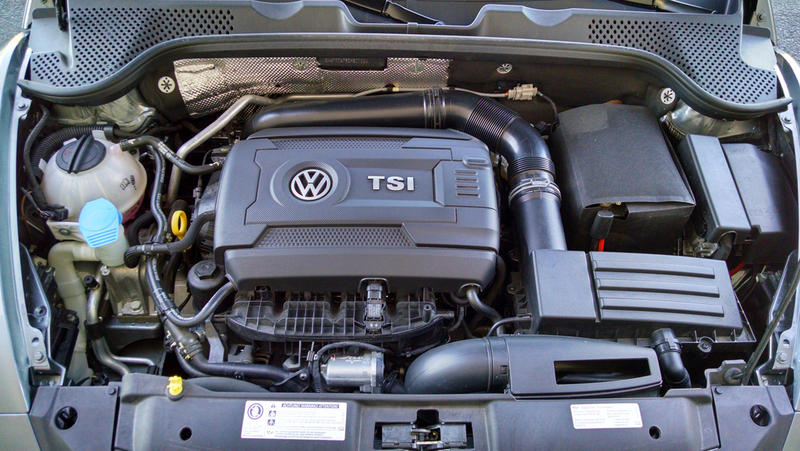 From the turbocharger, the air travels up to an inter-cooler mounted ahead of the radiator and behind the grille. It then heads up into the throttle body low on the front of the engine and then into a plastic intake manifold which features flapper valves to control flow at different engine speeds. 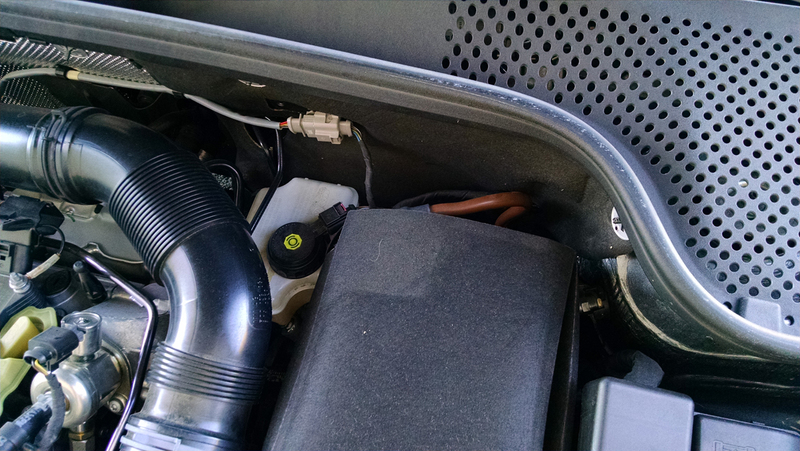 Looking around the engine compartment, service points are mostly easy to find and access. Windshield washer fluid and coolant are located at the passenger side. 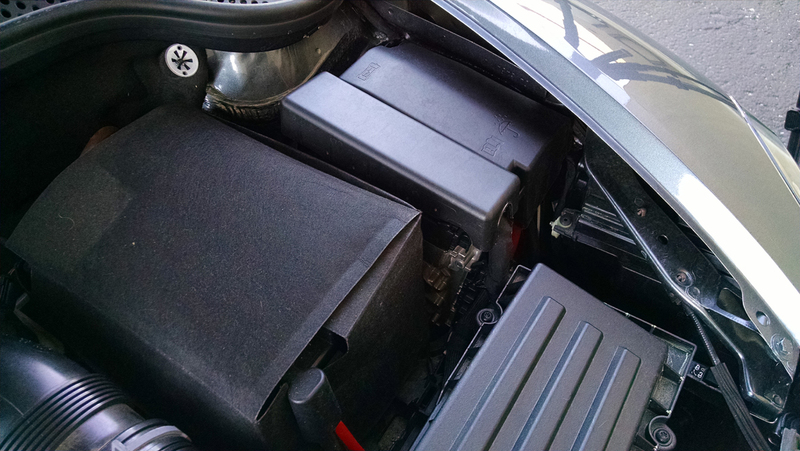 On the driver side, is the air filter box and battery, next to it the fuse main block. 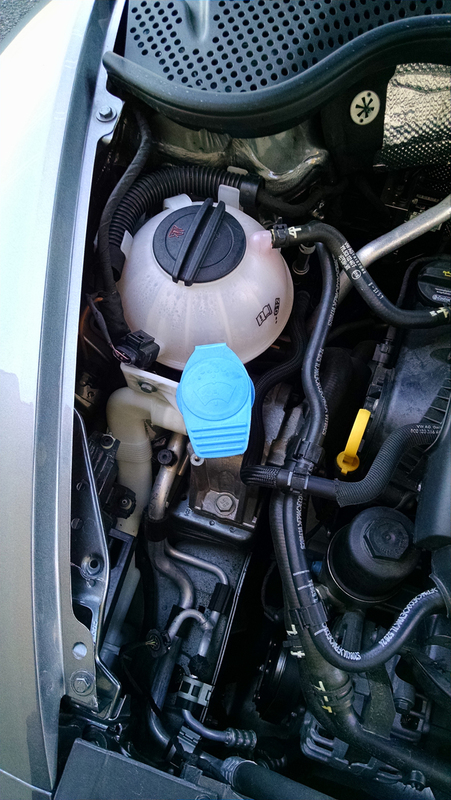 Getting to the brake fluid is a bit trickier, it’s located down low under the intake air tube. Checking it will require some gymnastics, filling it definitely needs a long tube funnel. Removing the air tube might make it all easier. Atop the passenger side of the engine is the oil dipstick, filler cap and even the oil filter is right up high at the top where you can change it very easily.